Laparoscopy (key-hole surgery) is the standard for cholecystectomy (gallbladder removal), and for a gamut of other general surgical operations. It offers the same operation as its open surgical equivalent procedures, often with higher precision from a magnified view of the operative view, while conferring advantages stemming from smaller scars. These advantages range start from the most pertinent from the patient’s perspective, in less post-operative pain, which in turn confers a faster recovery and earlier return to normal function. On the other end of the spectrum of advantages, smaller scars offer better cosmesis, and better patient satisfaction. Standard laparoscopic cholecystectomy with a 4-port technique involves the use of abdominal incisions to allow the passage of trocars through which key-hole instruments are passed to carry out the operation. These incisions in the standard set-up are 2x11mm and 2x6mm. While these already confer significant advantages over the open operation, where an 8 to 15cm incision is made, the pursuit for smaller scars has certainly not come to an end with laparoscopy. Mini-laparoscopy is simply laparoscopy using trocars with a smaller diameter than that used in standard laparoscopy. 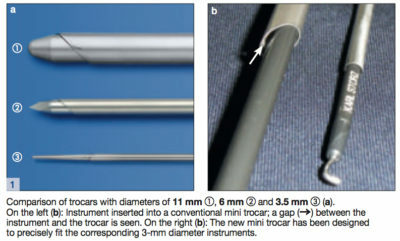 The regular 6mm trocars are reduced in size, such that a mini-laparoscopy cholecystectomy will typically employ 1x1mm and 3×3.5mm trocars. Mini-laparoscopy can be seen simply as an extension of conventional laparoscopy, made possible through the advances in surgical instrumentation. The history of mini-laparoscopy dates back to 1996, when it emerged in the pursuit of smaller surgical scars. The original mini-laparoscopic instruments were often flimsy and bendy, not offering the same dexterity as conventional laparoscopic instruments. In addition, these instruments were fragile and easily broken, adding to costs. Not surprisingly, it was then unpopular and was not adopted widely by laparoscopic surgeons. New low-friction mini trocar systems are purpose built to precisely fit corresponding 3mm diameter instruments, hence minimising unnecessarily larger trocar incisions. In addition, the diameter-adjusted conical tips produce less tissue trauma when passed through skin and muscle layers. Using a volumetric analysis of the trauma created by various methods of minimally invasive surgery, it has been estimated that the total trauma of access is halved in mini-laparoscopy, compared to standard laparoscopy. The mathematical model uses the total volume of a cylinder (π.R2.h) as a projection of the size of trocar, which is a direct reflection of the trauma during access. 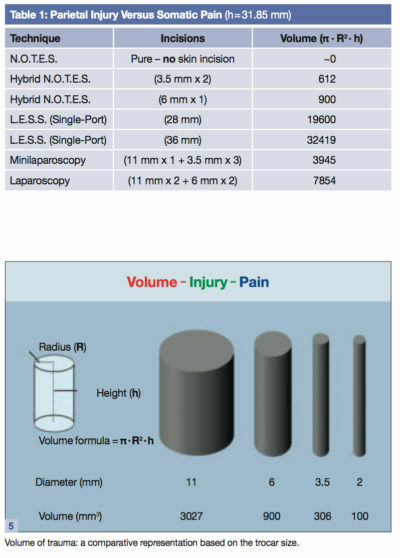 The total access volume in minilaparoscoy was calculated to be 3945, in comparison to 7854 in standard laparoscopy and 32419 in 36mm Single Incision Laparoscopic Surgery (SILS). Since then, other minimally invasive techniques have been developed. Natural Orifice Translumenal Endoscopic Surgery (NOTES) and SILS have also been developed to decrease the number of ports and consequently, the trauma of surgical access. However, these have not been in widespread use yet, with some concerns of the overall safety and applicability. Even while NOTES has been conceptually a no-scar surgery, in current practice, most are still performed with one of more additional abdominal ports to allow useful abdominal organ retraction. Access in NOTES is also a real-world issue, as the vaginal route is denied in all but the multiparous. Therefore, while technically no-scar surgery is still a rarity and relatively impractical in current clinical surgical practice, existing laparoscopic instruments have been further researched and improved upon, for the purpose of achieving more natural looking scars. This has hence resulted in the new improved mini-laparoscopy. Mini-laparoscopy is most often applied for cholecystectomy, but can also be used in other basic operations such as the hernia mesh repair and appendicectomy. Advanced laparoscopic operations that can be performed with mini-laparoscopy include reflux procedures, Heller myotomy, sympathectomy, abdominal lymph node sampling and excision of abdominal mesenteric cysts. In the mini-laparoscopic cholecystectomy, the technique has been further refined into a clipless technique, where no clips are used to ligate the cystic duct or artery. The cystic artery is cauterised with conventional diathermy, and with the ligation of the cystic duct with use of intra-corporeal surgical knots. With the use of an improvised extraction bag with a sterile glove, the costs of operation are significantly reduced, with a reduction of the number of disposables used. In a case series of 1500 patients, Carvalho et al reported an average hospital stay of 16 hours, with 96% of patients discharged within 24 hours. With a mean operative time of 43 minutes (25-127 minutes), 2.8% needed a conversion to conventional 5mm laparoscopic cholecystectomy, but there was no conversion to laparotomy for any patient. The patients also reported little pain and great satisfaction with the cosmetic results of surgery. The main complications reported in the series were that of umbilical infection (1.9%) and umbilical hernia (1%). There were no deaths, post-operative bleeding, no inadvertent intestinal or bile duct injury and no open conversions. 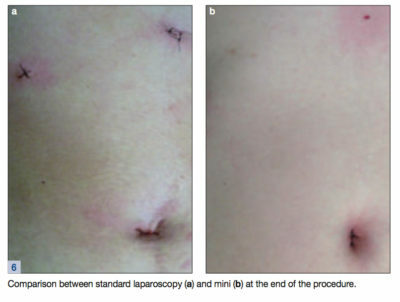 In summary, mini-laparoscopy can be seen as a refinement of conventional laparoscopy. It allows applicable operations to be performed at similar ease and safety profile, while having even more diminutive, natural looking scars. To find out more on mini-laparoscopic surgery, contact Clinic for Digestive Surgery at +65 6570 2702 to speak to Karen, our Clinic Nurse. Alternatively, you could drop us an email at doctor@clinicfordigestivesurgery.com.